No matter how hard we try to foresee the future, the weather can be an unpredictable force. The local news will show predictions of what the next week will look like, and there’s even an entire channel dedicated to showing rain patterns and cloud movement. Despite these efforts, we are still often surprised by heavy rain falls, freak snowstorms, or freezing cold windy weather. Sometimes people forget about the glory of summer when they’re making their way through the rest of the year. The brisk cold of fall, the endless snow and chilliness of winter, and the dreary rains of spring eventually fade away into glorious, golden summer. One day you may wake up and realize that it’s the middle of June! When this happens, your eye may turn to your empty patio. You may wish to entertain friends and guests with the aid of some outdoor furniture. Don’t feel as though you’ve procrastinated and now it’s too late to enjoy the summer weather. You can still have your best friends over and enjoy the warm weather even if you’ve waited a while. Visit an outdoor furniture outlet to find the perfect set for your patio without driving yourself crazy with effort or spending your savings account. Before you know it, you’ll be relaxing outside under the hot sun and enjoying the company of your nearest and dearest. Here’s a rundown as to why an outlet is your best choice to prepare your patio for summer fun quickly. Shopping for seasonal goods can be risky sometimes. You’ve likely gone shopping for a bathing suit or some sandals when summer is in full swing, and been horrified at the prices. Traditional retailers know that people who are buying their summer goods are willing to pay out the nose. If you don’t want to fall into this trap, then it’s time to find another seller. An outdoor furniture outlet will keep low prices all year round. This option ensures that you won’t be shelling out big bucks that line the pockets of traditional retailers. Society has carefully trained the average consumer to see a larger price tag as a sign of greater quality. You may be worried that going to an outlet and buying furniture for a lower price is simply too good to be true. However, the outdoor furniture outlet can afford to have these low prices without sacrificing the quality of the product. Whereas most retailers are located in central, urban, populated areas where rent is high, outlets are by their nature more secluded and lower in maintenance. You can go to an online outlet with the furniture you’ve been dreaming of without having to withdraw your entire savings account. Going shopping in the summer can be a hectic, overwhelming experience. This worry and stress is multiplied when you’re looking for expensive goods that require a great amount of thought, and seasonal goods that have a ‘time limit’ on them. It can feel like you’re competing with dozens of other people, all looking for the best deals and the most attractive pieces. Shouldering your way through swarms of people and being hustled past the furniture you want to examine by eager shoppers can really throw you off and make you confused about what purchase you want to make. Meanwhile, an outdoor furniture outlet is a breath of fresh air. These online shopping centers have the entire inventory for you along with pictures and descriptions. You can take as long as you like to look at every set, as well as take advantage of deals. A trip to the outlet is relaxed, and you can take your time and pick the set that you love. Don’t allow yourself to be rushed through a shopping trip when you’re looking at a large purchase. Take your time and do things right. When you look out on your patio and envision the perfect summer set up, you likely want to put those ideas into reality. When you visit traditional retailers, you often find that your dream has tight restrictions on it. You may feel forced into picking a set that isn’t anything like you pictured. When you visit an outdoor furniture outlet, these restrictions vanish. Traditional retailers have a limited amount of real estate and space, and so they often end up picking only the most fashionable and likely to sell sets to put on display. If anything is going to sit, take up space, and gather dust, they have no need for it. However, these sets that are less popular are often the ones with the most personality. You may find yourself bored and uninspired by the sets at a traditional retailer, but an outlet can have vintage sets or unusual builds that are far more exciting. Browse a variety of sets before you settle on the one that will grace your patio all summer long. You may have lost track of the time, and suddenly summer has rolled around. Don’t worry; you can prepare your summer patio for entertainment and relaxing without wasting away the best weather of the year or taking out a second mortgage. Simply visit an outdoor furniture outlet for a superior method of summer shopping. When you try to check out traditional retailers, they’ll have punishing season prices. An outlet lets you dodge this money sink and enjoy reasonable prices. You’ll also avoid the frenzied crowd of consumers who turn into a mob and ruin your placid experience. On top of these bonuses, you can enjoy a larger selection of outdoor furniture. Before you know it, you’ll be heading home with the perfect patio set. 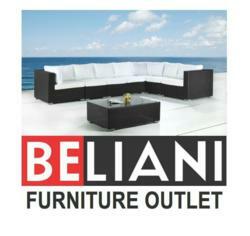 Enjoy your summer with friends and family by looking at Beliani’s selection of outdoor furniture and dining sets. All your outdoor furniture outlet are very nice. I love all your furnitures.I am very encouraged to find this site. I love your dining set specially this one: http://www.beliani.ca/outdoor-dining-sets/rattan-wicker-dining-set.html. Are those available in different color of cushions?